It is Cheesecake Season!!! You are all waiting for my secret recipes, no doubt but the secret is not in the recipes. Anyone can make an awesome cheesecake by choosing a recipe that ”calls their name” and by using the best and finest ingredients available to you. Here are a few tips that I’ve learned over the years. They are sure to give you professional results every time! Using a paddle attachment, mix the cream cheese with the sugar and beat well. Scrape down the bowl and beat until you are certain that there are no lumps. The sugar melts the cheese, so if it is not smooth at this point, it will be hard to get the lumps out later. With the mixer on LOW, add the eggs, one at a time and mix just until incorporated. Do not beat air into the batter at this point as it may result in cracking. Add vanilla and flavorings according to your recipe. The addition of sour cream and heavy cream will lighten the cheesecake and make it more creamy. I use them in some but not all of my recipes. Butter the pan evenly with a cold stick of butter. A coating of cooking spray is also acceptable. Be sure to get every spot, including the rim so the cake rises evenly when baking. Otherwise, cracks may result. Bake in a preheated oven in a water bath. This means that the cake pan sits in a larger pan with an inch or more of water. Although someone recommended baking it for longer at a lower temperature, the only benefit I can see is that the finished color will be lighter. Likewise, leaving it in the oven to cool has no affect on the cracking of the cake. I have never had a cake crack after coming out of the oven. Due to time constraints, I bake my cakes at 325 or 350 degrees for about 1 hour and 10 minutes. I remove them immediately to put in the next batch. It’s totally fine. Never leave the oven door propped open if you have small children walking around. Cool the cake completely!!! Leave it on the counter or in the fridge for 6-8 hours or overnight. If using a springform pan, release the side and remove it (a one piece cheesecake pan can be immersed in a pan of boiling water for a few seconds and proceed). Then, cover the cake with a paper towel,top with a plate or cake board and flip the cake upside down onto the plate/board. Now your cake is upside down, so cover it with the plate/board you want to serve it on, and flip it back over. Slice the cheesecake with dental floss (preferably unflavored) for neat slices. Cheesecake is very versatile and durable. It can be frozen and defrosted several times without diminishing the flavor or texture. It will lose some of its’ creaminess the longer it is left in the fridge, but will last safely for up to 2 weeks. Unlike recipes for cakes and cookies, cheesecake is a baked custard and you can generally create your own flavors. A basic recipe is 2 lbs. cream cheese, 1 3/4 cups sugar, 4 eggs, and 1 tsp vanilla. From here you can add melted chocolate to 1/3 of the batter and marble it back in. Or experiment with different flavors. Add White chocolate to all of it or do dark chocolate in 1/3, milk chocolate in another 1/3 and white chocolate in another. The sky’s the limit! I tried following your advice….seriously did everything you said. I used the basic cheesecake recipe you provided. After 1 hour and 10 min. @350 the cheesecake was still shaking like it was liquid in the middle. I had to leave it in for an extra 40 minutes. The cake also rose around the rim more than it rose in the middle so the top wasn’t smooth. It did not come out of the springform nicely, plus the inside was loose so the cake fell apart. Do you have any idea why it didn’t work? I’m sorry that your efforts did not yield a perfect cheesecake! A cheesecake SHOULD wobble in the center when you take it out of the oven. It sets as it cools. Occasionally, I will leave it in for an additional 5 minutes if it looks like the center hasn’t risen as much as the rest of the cake. If the sides were higher than the rest of the cake, it sounds as though you may not have used a water bath. The reason the cake collapsed when you took it out of the pan is because it wasn’t cool enough. Even if the pan feels cool to the touch, the inside may be too warm to hold itself up. It is best to chill for 6-8 hours or overnight. The cheesecake pan needs to be in a water bath. A pan of water in the oven will not do the trick. I was hesitant to put the springform into water because I thought the water might seep into the pan. And in fact it does. Some people recommend wrapping the outside of the pan with foil but I don’t find that it helps. A little water seepage will not damage the cake. 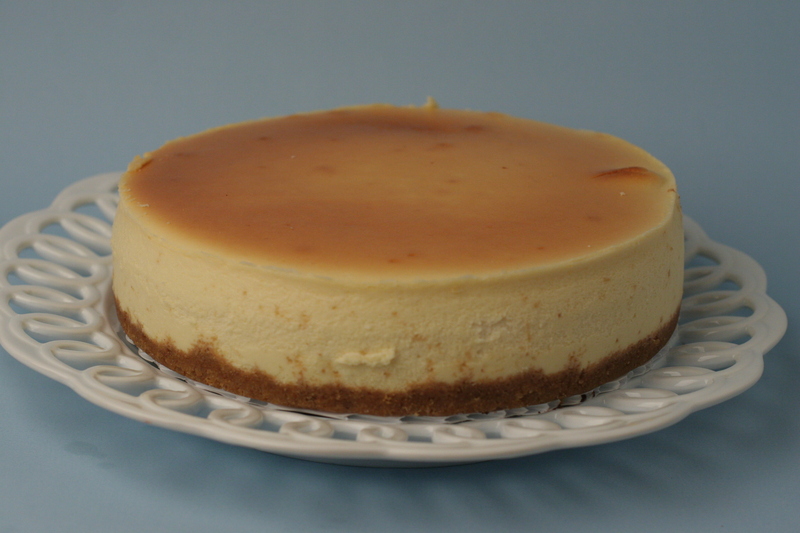 Alternatively, you can us a 1 pc “cheesecake pan” (8x8x3 or 9x9x3 rounds). Briefly (few seconds)warm the bottom of the pan before inverting.